Why can't we face the truth? Having an autistic child wrecks your life. The title of Carol Sarler's article in today's Mail Online pretty much tells the story. It has all the drama you would expect from the title--a child who "screams like a banshee," moments of "everyday terror," parents who will never work full time again, an entire family ruined by the presence of an autistic child. Even the grandparents are starting to have disagreements over finances! Sarler concludes her sad tale with her unsolicited opinion (it would be "impertinent," you see, to bring this up to the mother, yet not so much to broadcast it to all of cyberspace) that life would have been better for this family, for all concerned, had "Tom" never been born. I have no doubt that Tom is, through no fault of this own, a tremendous burden. Oooh, you're going to have all the dogooders at your throat, but yes, his life should have been one unlived, sad but true. Amen, no one is brave enough to say it but we all think it. What misery for all involved. Finally, someone with the spine to state the obvious. Thank you Carol Sarler. Madam, you are very right. Something else, probably never thought of - the poor neighbours suffer as well.. their quality of life is also changed for the worse if they have the misfortune to live above, below or next to a family with such a child. A very moving and thought-provoking article. I think many more people than are willing to let on would abort an autistic child if they knew. Yes, there are more, feel free to look it up if you feel like taking a few punches to the gut. Yes, I know that the Daily Mail is not to be taken seriously as a newspaper. But the number of people writing in agreement with Sarler is hard to take. I have surrounded myself with people who agree that disability is not a tragedy, parents who treasure their autistic children. People who don't assign ultimate value based on what someone can or cannot do. Some call this "burying one's head in the sand," I suppose. I see it as a necessity. The will to go on can be fragile. Do these commenters not even stop to think how this reporting of wrecked lives might affect their autistic family members? Or do they seriously believe that autistics are not aware of their openly expressed opinions? When people won't listen to reason. the only way to argue with them is to keep on keeping on, to keep on living. Just by living, just by existing, you refute everything they say. wow. I work with a woman who is the mom of an aspie young woman who just started college. Since my aspie daughter has been through that experience, we talk a lot. In fact, yesterday we were talking sort of on the same lines of this article, but with a twist. Our thought is we understand our daughters have a different path than we had in our heads for them. We both look at the difficulties we have we something *we* can change. We have to change our expectations. We have to change the expectations our families have (you know, when you graduate from college you get a job and are independent...why is that the only way for things to be?) We have to figure out how to help our daughters find a path when the path provided to young women doesn't really fit their needs. Is it hard? Well, yes. It's not what I expected so I have to change my world view. Has she wrecked my life? NO! My life is more full and more complete because of her. I would be an evil mean person just like that author of that article if I had never had her in my life. I just finished reading The Curious Incident of the Dog in the Nighttime, so this really shakes me. People can really be so heartless. I'm horrified at those comments. Not totally surprised that some people feel that way, and yet it still is upsetting to read them. I can't imagine thinking that any person is so lacking in integrity and personality and value that it would be better had they not been born. Favorite comment: "I note she describes Tom screaming and running away from her as a sure sign of autism. I would describe it as insightful." Thanks, bullet - those mums are lovely, I feel quite a lot better after reading those responses. Why do people read these vile newspapers? My grandmother read the Daily Mail when my dad was young, and I remember my dad saying "I hope my upbringing hasn't made me do racist things." He's autistic like me (though I'm the only one with the diagnosis), and very, very rarely speaks at all, so that comment stuck in my mind. He shows more positive qualities in that one comment (like thoughtfulness and care for others) than that writer has ever possessed in her life. Also, the woman (and commenters) seem to think that children are nothing but pretty accessories. If you want yourself to be your main priority, why on earth would you have kids of any sort? gminks! Within your comment is a great message. "My life is more full and more complete because of her. I would be an evil mean person just like that author of that article if I had never had her in my life." These people are like we have been and likely could be again (in some other part of our lives) Scared shitless and running from pain.. but pain.. suffering... these are the things that bring patience.. love... if one can stop running from. Poor Tom with that family so intent on self pity, they don't see that they are making things ten times worse. You dont; have to be autistic to show all the signs of emotional neglect and/or abuse. It's so sad. 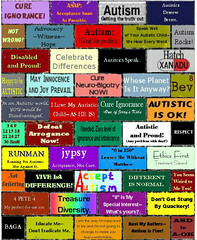 Life as, or with, or both an autistic is different than everyone elses (NT) lives. Not better, not worse, just different. We don't have Norman Rockwell, but then either to very many NTs. It is what it is. It's just sad that NT parents and family can't give the spectrum person the space to be who they are. Funny, my word verification is equal. "Just by living, just by existing, you refute everything they say." That nicely sums it up. This is a war of eugenics. They want to stamp us out. Those articles are simply the propaganda used to encourage hatred toward 'the enemy'. Wow. Because having a perfect NT child is the answer to everything. Because that would make life easy and hunky dory. Bev I know what you mean. I too feel that I have mostly insulated myself from the evil words of harpies like Carol Sarler. She is one of those writers who loves to make herself out to be the contrarian, the only one with the guts to tackle the political correctness of the status quo. She's really horrid. I looked at the article and some of the comments and stupidly started crying. It's so very wrong. I can guarentee you that if I so choose, I could match Tom's mum with stories of difficult times and tantrums. I have written about it. But it is not all the time and they problems they face have certainly been blown out of all proportion. That poor child. We have to keep on. There's nothing wrong with surrounding ourselves with like minded people. It's hard enough to live at times. When I'm strong enough I tackle the hate speech in a small way but it hurts. Our life is certainly a roller coaster, but then the roller coaster has always been my favorite ride. Evan's too! the Mail and its readers are anti- immigrant, anti-gay, definitely anti anything remotely left or liberal. If they are anti autistic as well it may be depressing but at least it means you are in good company. It's sometimes worth reading stupid articles like that just to find out what some other people are thinking. But I still believe that there are lots of people in the world who have a more enlightened view of things. Fortunately. Really interesting piece, thank you - - and you're right of course, the Mail is not to be taken seriously as a newspaper. That article upset me so much, anger and disbelief were my first reaction on reading the actual article but then the many many people who supported her near broke my heart. I'd hate to think my son would ever come accross it or that the people around him even though they dont always understand him think that. How is she able to peddle such vile rubbish aimed at a specific group of people surely this is descrimination under the law?? Sadly, this is why, in 2009, we still are getting young people who are autistic placed in institutions. We can only hope that children who have families with such negative attitudes toward them have at least one person somewhere in their lives who loves them for who they are. I had a look at the piece, because I was reading your blog. As the mother of 2 sons, both on the spectrum, I was astounded. OK, it's not easy, or ideal, but instead of criticizing the family and making the generally uneducated Mail readers decide that autistic people should be put-down, maybe her writing skills would have been better used in raising funds to make life a bit easier for families with these sorts of problem?
" Immediately after diagnosis, she beat herself senseless with blame; so many theories, each making it her fault. Should she have allowed her son to have had the MMR jab? Was it, as some said, a behavioural disturbance caused by 'bad' parenting? Once, she even convinced herself (from something she'd read) that it was mercury poisoning from eating tuna during her pregnancy. " That's not autism wrecking lives. That's bad (and disproven) scientific theories wrecking an innocent woman's self-esteem. If her son had died of measles, that would truly have wrecked the lives of three generations. "This, then, is their life sentence: to worry, every hour of every day, what will happen to Tom when they are gone." In a less bigoted worls with more disability services, they'd never have to. "I note she describes Tom screaming and running away from her as a sure sign of autism. I would describe it as insightful." Remeber that Cath (if she really exists and was not invented by Carol Sarler) didn't actually ever explicitly say that Tom had ruined her life. She just related her experiences to Ms. Sarler and Ms. Sarler decided to interpret them in a very destructive way. For all we know, Cath (assuming she's not imaginary) doesn't want a "normal" son, just more help in dealing with the son she has. Ok, cancel that last bit of my comment. I just realised that "her" referred to Ms. Sarler and not to Tom's mother. Sorry for misinterpreting. I do not mean to impugn anyone's experience, or to suggest that the journalist necessarily interpreted the parents well. But I would ask people here to consider that having an autistic child might indeed be a kind of death, and an extraordinarily difficult existence, for many parents. The talk I see here -- the talk, of course, born of hurt feelings -- is very like the talk I see in the mental-illness communities. There's a lot of outrage over people saying similar things about caring for mentally ill children. I can tell you, though, that being the child, sibling, spouse, or parent of a seriously mentally ill person can be a profoundly harrowing, destructive experience -- however many feelings that may hurt. That harrowing, that destruction, is not the fault of the person undergoing it. I think it's extraordinarily cruel to look at such a person and say that he or she is choosing to be harrowed and destroyed. Particularly when that person's free to hand over the responsibility of care to someone else -- to have the other person institutionalized -- but doesn't. It may well be that raising an autistic child -- caring for an autistic child -- is harrowing and destructive in a similar way. Until you're in that position as someone who isn't autistic, maybe it's unwise to judge? Again with the "hurt feelings" accusation? How many times does it have to be said--this is not about "feelings" but the real life consequences of being seen as tragic, less than human, a cause for despair. Those consequences include not only depression, addiction and suicide, but also social exclusion, unemployment, bullying, torture and murder. I have very rarely said this to anyone, but your comments are not welcome here. If you would like to ask people to "consider that having an autistic child might indeed be a kind of death," well, there are plenty of places that welcome that sort of hate speech. This is not one of them. Seriously, this sounds exactly like the type of stuff the Nazis said about Jewish people. There are many degrees of autism. I think you shouldn't criticize someone for expressing their misery, if you haven't offered to babysit their kid for them.